My day job is as a freelance book editor, mostly cookbooks. I am grateful beyond words (sorry about the pun) to be able to work with food writers and chefs. I learn new things every day. I recently had the chance to work on the manuscript for “Eat More Vegetables” by Tricia Cornell (soon to be published by Minnesota Historical Society Press). Tricia wrote the book for all those people who sign up with a CSA (community supported agriculture), and then don’t know what to do with the weekly box of lovely produce. The book inspired me to expand beyond our usual veggie repertoire. We’re very fond of spinach, zucchini, broccoli, carrots, bell peppers, asparagus, green beans, and peas. That’s a decent variety, but Tricia reminded me that there are all sorts of other healthy, delicious vegetables that are languishing beyond the realm of our kitchen. Fennel got two thumbs down ( I like it, but the guys not so much). Kale chips were a big hit with all of us. Artichokes and eggplant were rated just okay from the Y-chromosome contingent. Next on the list: parsnips. Mashed seems to be a popular choice for parsnips, but I wanted something different. Roasted french-fry-sized parsnip sticks were sweet with creamy interiors — fantastic. An hour and a half later, the pork was falling off the bone. The carrots were their usual meltingly sweet selves. 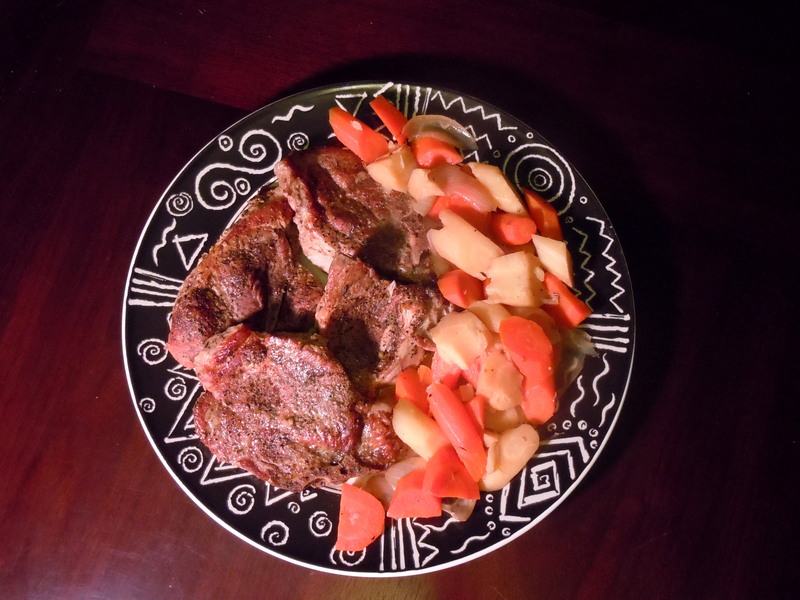 The parsnips were more subtly sweet, with an underlying tang that was a pleasant contrast to the rich pork. One new vegetable is now added to our repertoire. What should be next? Peel the carrots and parsnips; cut into large chunks. Cut the onion into large wedges. Pour the oil into a stockpot or dutch oven with a lid and place (uncovered) over medium-high heat to warm up. 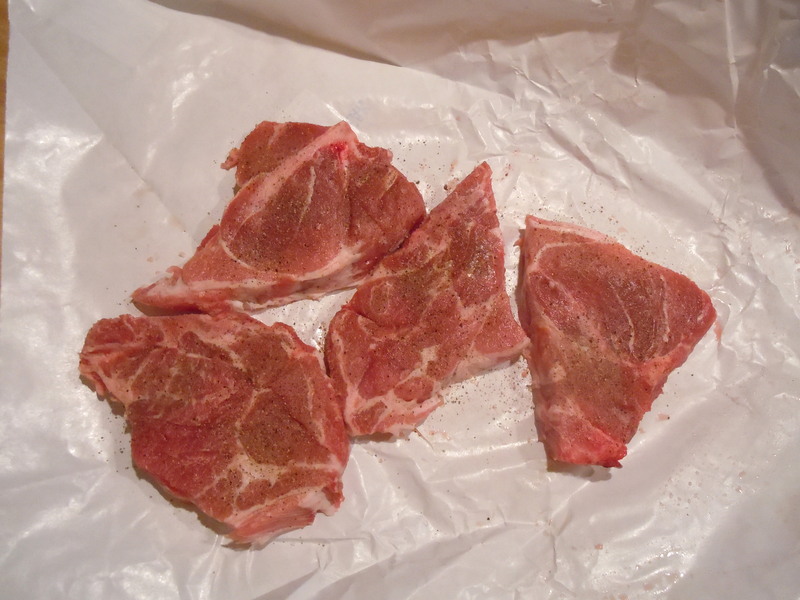 Sprinkle the pork liberally with salt, pepper, and thyme. Place in the pot and brown well on all sides. Remove the meat and add the veggies. Sauté for a few minutes. Add the wine and stir to loosen the browned bits on the bottom of the pan. Return the meat to the pan, add the garlic cloves and stock, and turn the heat to low. Remove the meat and veg to a platter and cover to keep warm. Pour the liquid into a fat separator (or just pour into a bowl and set aside to allow the fat to rise). Melt the butter in the pot; turn the heat up to medium. Add the flour and stir to combine. Whisk in the separated liquid (leave out the fat). Peel the braised garlic cloves and mash the soft garlic into the sauce. Boil for a few minutes until the sauce is thickened. Add more stock if needed to thin out if you wish. This entry was posted in main courses, meat, poultry,and fish, veggies and tagged braising, carrots, parsnips, pork, slow-cooker. Bookmark the permalink.